Newcastle-upon-Tyne (St. John's Westgate and Elswick) Cemetery. Private Gibson's headstone is in the left foreground. 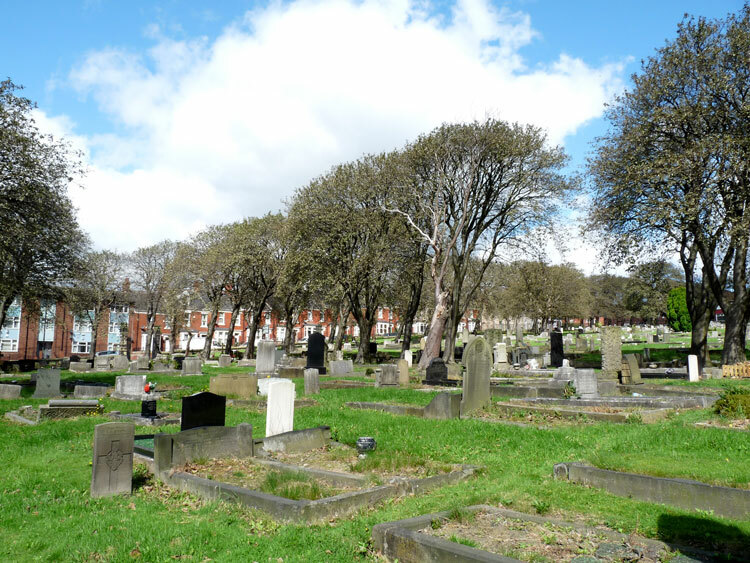 Newcastle-upon-Tyne (St. John's Westgate and Elswick) Cemetery contains 179 First World War burials and 105 Second World War burials. 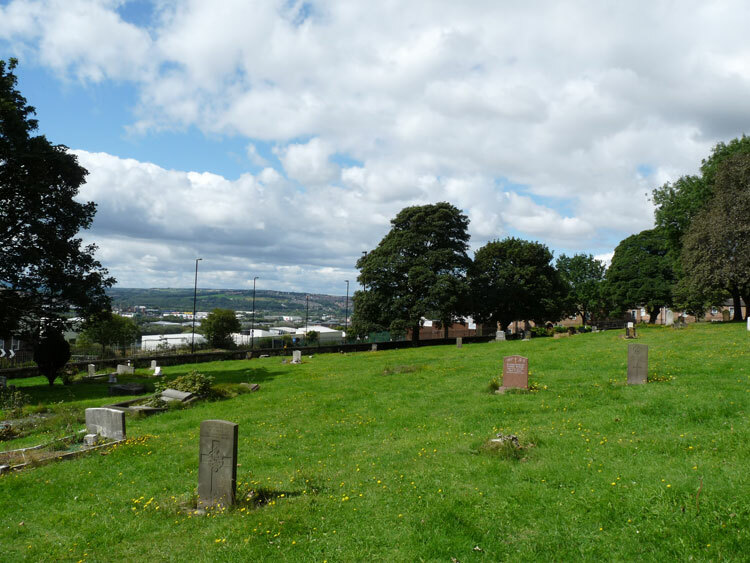 There are three graves of men who served with the Yorkshire Regiment in this cemetery. 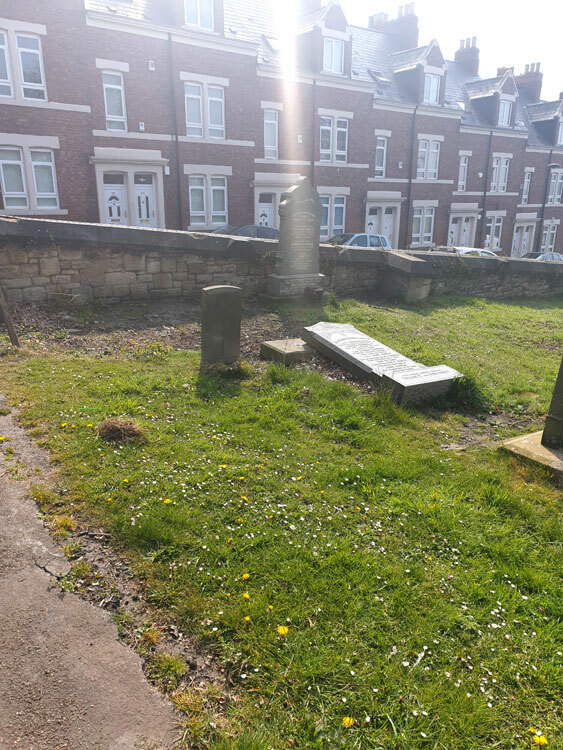 We are very grateful to Mike Berrell (<mike_berrell@ntlworld.com>) and Wayne Bywater (<waynetyke123@aol.com>) for photos of the graves and of the cemetery. Select the small image of a headstone for a larger sized image which opens in a new window. Private Walter Charles Bell. 16945. 7th Battalion Yorkshire Regiment. Son of William and Annie Bell, of Middlesbrough. Husband of Annie Bell of `Swineshead, Northend, Boston (Lincs). 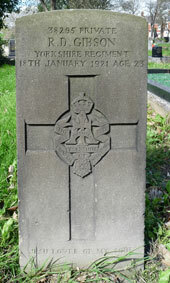 Died at home 30 November 1918. Aged 31. (Additional information : Enlisted 21 August 1914. 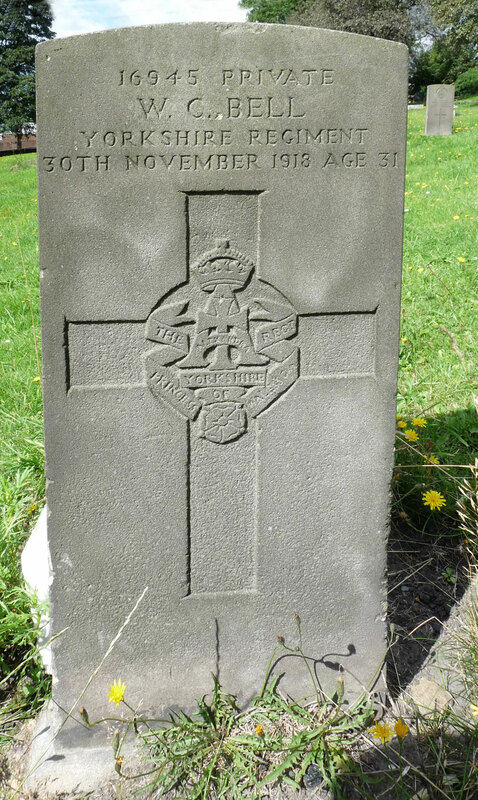 Served in Gallipoli with the 6th Battalion. Transferred to 7th Battalion and was wounded at Fricourt, 1 July 1916. Discharged 7 February 1917 due to right arm amputated after gun shot wound. Private Robert D Gibson. 38295. 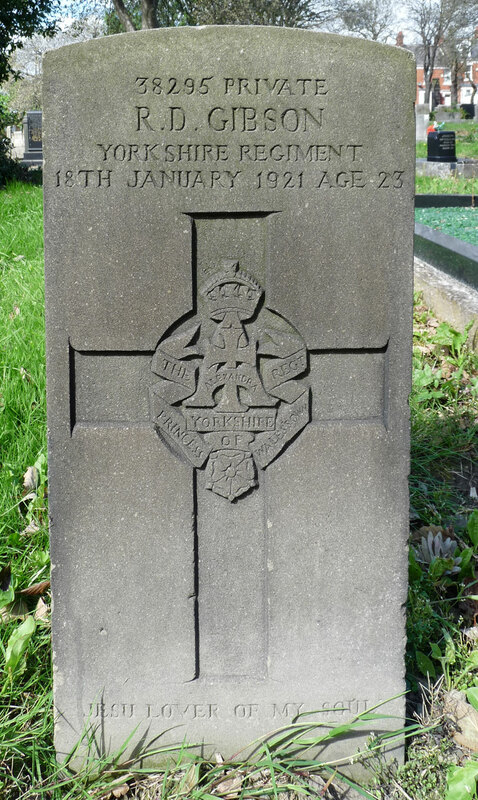 The Yorkshire Regiment, transferred to (578394) Labour Corps. 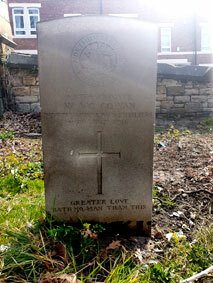 Son of Mrs. Lily Gibson, of 39, Rye Hill, Newcastle-on-Tyne. Died at home 18 January 1921. Aged 23. 36th Battalion Northumberland Fusiliers, formerly 5923 the Yorkshire Regiment. Husband of Elizabeth McGowan, of Oaklea Bungalow, Steele's Land, Earsdon Rd., Monkseaton West, Northumberland. 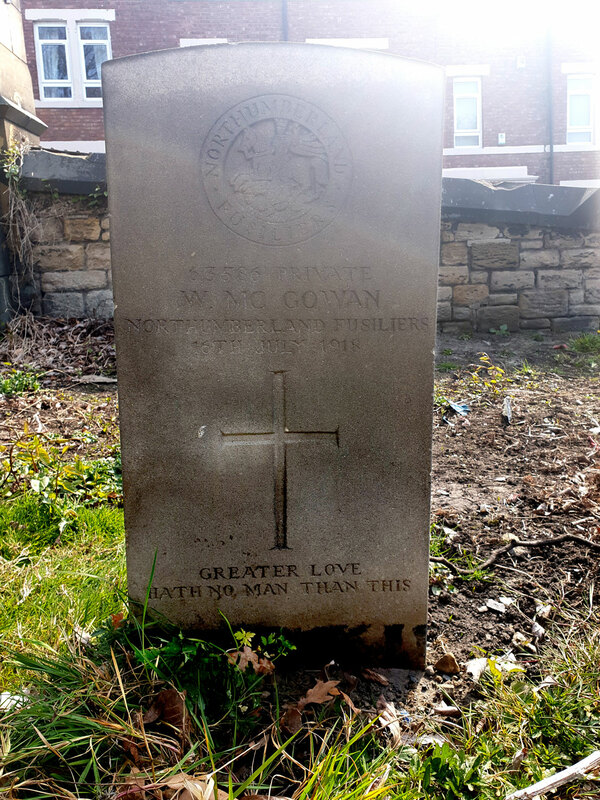 Died at home 16 July 1918. Aged 40. HATH NO MAN THAN THIS"